AS Software specializes in integrated solutions for maximum interoperability with healthcare information systems (e.g., HIS, RIS, PACS, EMR, practice management, billing and dictation). Managing the health of patients in today's interconnected world requires the exchange of information across platforms for efficient delivery of patient care. We have extensive experience building complex, vendor-neutral interfaces. Unlike other software providers, our expertise allows us to build, deliver and maintain our own interfaces that are scalable, robust and compliant with DICOM & HL7 standards. AS Software's application engine seamlessly integrates into a wide variety of environments and reliably exchanges information across platforms. All solutions are completely scalable and capable of handling the throughput demands of even the largest institution. Regardless of the structure of your organization, AS Software provides maximum interoperability. AS Software's skilled engineers build, implement and support the interfaces to our ultrasound reporting, image management and EMR solutions, eliminating the need to deal with multiple vendors. Below is a sample of the healthcare vendors to which we currently interface: 3M, Affinity Healthcare Solutions, AGFA HealthCare, A-Life Medical/Ingenix, Allscripts, Amicas, Carestream Health, Cerner, Cloverleaf, Eastman Kodak, eClinicalWorks, Eclipsys, eGate, Epic Systems, Fujifilm USA, GE Healthcare, HBOC, Hyland, IDX, Intersystems, Keane Care, McKesson, Meditech, MedPlus, MedQuist, Misys, Neusoft, NextGen, Nuance, Perceptive Software, Philips, QuadraMed, SAP, Sapphire, ScImage, Siemens Medical Solutions, Triple G, and Worldwide Transcription. AS Software's interface engines are architected to simplify the exchange of structured health information and images, making it possible to share patient information throughout the organization. Our solutions meet or exceed published standards so as to enhance patient care, and reduce cost associated with implementing and maintaining an integrated solution. 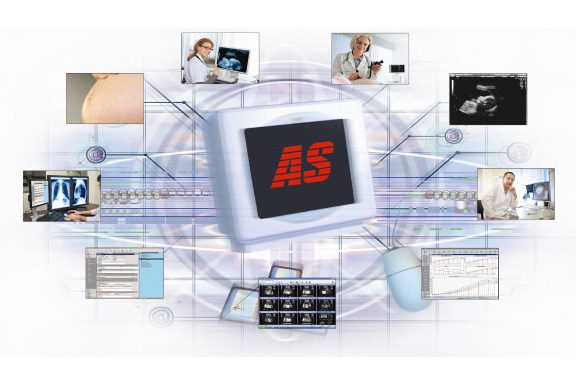 For over two decades AS Software has delivered integrated ultrasound reporting and image management solutions. With this experience, AS Software has mastered the implementation of its applications and interfaces. AS Software is committed to meeting your time lines and exceeding your expectations. When contacting AS Software for customer support, you will be assisted by trained and knowledgeable technical engineers capable of delivering timely resolutions. Superior customer support is not only AS Software's commitment, it is the cornerstone of our relationship with clients. To learn more, please click here for our Client Testimonials.